Glycerin, Aqua, Tetradecyl Aminobutyroylvalylaminobutyric Urea Trifluoroacetate and Magnesium Chloride. 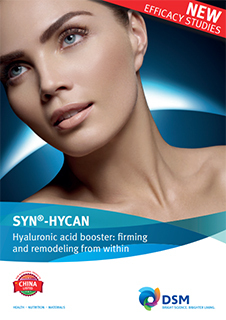 SYN® -HYCAN by DSM acts as a firming agent. It contains synthetic tripeptide with mol weight below 500 D. Boosts significantly synthesis of hyaluronic acid by stimulation of GAG biosynthesis and improves collagen fiber quality by increasing decorin and lumican levels. It is preservative-free and glycerin-based aqueous solution. It is needle-free hyaluronan booster, removes visibly skin sagging in the chin and décolleté area and leads to visible remodelling effect and a firmer skin. 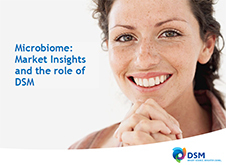 It is safe for topical applications. Used in firming and body remodelling treatment and anti-sagging treatment. It is listed on CHINA regulatory. It has a shelf life of 36 months.